Recently on Smogon there has been some interesting talk about Missingno. The Missingno. in the list do not correspond to typical evolutionary/etc. boundaries; e.g., Slugma–Magcargo, Houndour–Houndoom, Phanpy–Donphan, Smoochum–Elekid, and the legendary beasts are all separated by multiple "real" Pokémon. There are entries in the trade list for the sprite placeholders, which were obviously never meant to be Pokémon. As Koolboyman pointed out, the cries do not seem to match up. The entries are in numerical (GSC) order, whereas RBY Pokémon are stored in the order they were created, more or less. That said, it is interesting that Ho‐oh does not follow the Pokédex order, and Celebi is not in the list at all. What can we figure out about the original Missing Numbers? Cries. Some Missing Numbers have blank cries, but a few are interesting. This seems to be the only concrete evidence that the Missing Numbers were removed Pokémon. Sprites. Only three have defined sprites (fossils and Ghost), and these were only used as placeholders for convenience. I’m leaving this thread stickied. If you find anything interesting about Missingno., please post an update. Besides, I never thought the fossil pokemon were actually Missignos too (though what else they could be, trainers between F8 and FF ?). The Table in Gold looks pretty much like a rearrangement of numbers. Take an excel table, expand it to 000-255 entries, then rearrange. Some guy probably just missed the "Ho-Oh spot" on the first go and quickly pulled another number from the end. I don't think you'll find anything concrete at all. They had to fight for every bit worth of data, because they could only afford small carts for the first batch. They even went as far as saying that they removed the debug stuff and only then added Mew in as a hidden gimmick, because it freed some 300 bytes' worth of data. This is depressing but probably right. Still, there might be something left to find—after all, they could have saved 120 bytes by putting cries in Pokédex order, but they didn’t. Maybe there are other cases like that, where they either forgot or didn’t think the small amount of space saved was worth the trouble. This is depressing but probably right. Still, there might be something left to find—after all, they could have saved 120 bytes by putting cries in Pokédex order, but they didn't. Maybe there are other cases like that, where they either forgot or didn't think the small amount of space saved was worth the trouble. Actually, while interviews suggest otherwise, I think the final cut on cost came pretty late in development, so they had to cut stuff out last-minute. The Pokémon probably were inserted in their creation order and then the evolution families were matched as the Pokémon were drawn. That way, programming and asset creation (since there were no Pokémon to use to begin with) could go in parallel. Also, that way, if they had used all 190 Pokémon, the whole system of internal numbers and PokéDex numbers wouldn't seem so strange. It becomes strange because of the holes in the internal order. 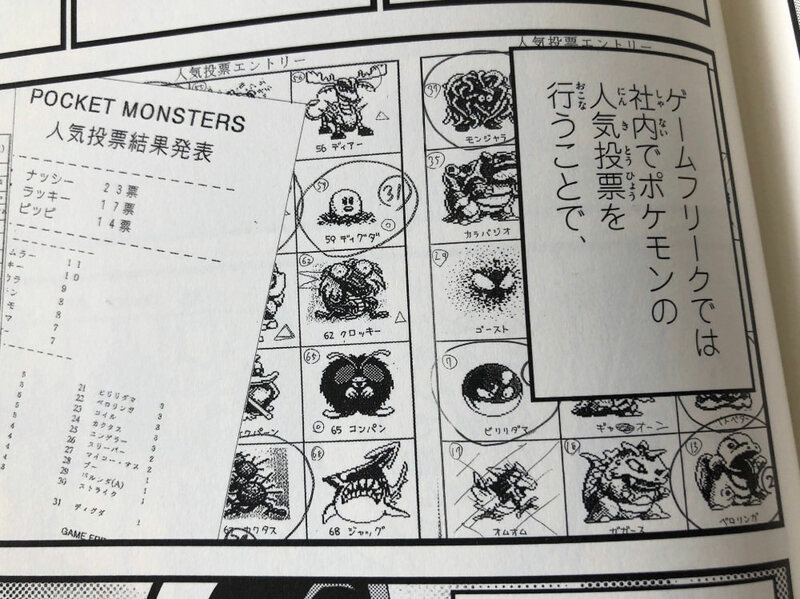 One might even get lucky and get some official art with internal numbers on it (like Rhydon being #1, Kangaskan being #2 ...) for the numbers that finally went unused. The PokéDex order was probably decided upon once all final Pokémon and evolution families were there, so they couldn't have known those while programming the game, and they probably had not decided upon these before creating artwork, so they could not have predicted how many 2 & 3-evolution families there would be. So yeah, I guess they had to make a choice and decide which Pokémon would make a great debut in the first games, so yes, you might find some beta stuff. However, I guess really everything that wasn't needed was not included in the end. You would probably have to check out a Japanese cart for any unused text that didn't make it into any of the other releases. Has anyone emailed gamefreak japan and asked them? There is no need to contact Game Freak, Red and Green had to be rushed in order to meet a certain deadline, which is why the glitches in Gen 1, as well as these missing numbers exist, so they could not have tested the games in time. They already knows about Missingno, that's why they fixed the glitch in Yellow. About the numbers after Mew in the R/B/Y Pokedex, apparently, they had already made most of Gen 2 by that point (the first episode of the anime shows proof), but they had to rush to the release, so there was no time to program them in (and not enough time to test the games), resulting in the abundance of glitch Pokemon in Gen 1. If one counts the empty slots, there are a total of 39, almost half the exact amount of Pokemon introduced in Gen 2, meaning that the Time Capsule would have allowed us to trade Gen 2 Pokemon to Gen 1, so we would still have only 151 Pokemon in Gen 1, we just were not supposed to KNOW there was more yet. Personally, I think that 151 was enough Pokemon at the time, because 200 would be a little too much, and mind you, a lot of Pokemon were made for Gen 2, such as Honoguma and Kurusu, but were cut out for reasons unknown, possibly because the data was full and they could not add any more. Torchickens did some research, and found some links to pre‐release material that might be relevant. Also, stag019 showed where the pointers for Missing Number’s base stats actually lead. We already knew this, but it’s nice to see the specifics. Speaking of that, if you'd like to make a copy of that for the iimarckus.org homepage, I wouldn't mind and would actually encourage it. There are no guarantees for the future availability of the romendo.net domain name as well as my part of the server space (I don't own it, a friend lent me it). Sure, mirrored here (with minor formatting changes due to my OCD). Unfortunately, due to hosting rules I cannot give anyone else direct upload access to the server. But if you have anything else you want mirrored or hosted, send it to me. Is it possible to use these 39 (well, not counting the ghost and fossils) free spaces to add new Pokémon? Missingno scares me. So stop talking about it please. I noticed that in Generation I and II Staryu and Starmie are in the medium-slow growth rate, which is normally used for members of Pokémon whose basic form evolves twice (except Butterfree and Beedrill) as well as Mew. Maybe this means there was once a Missingno. that was either an evolution of Starmie, an evolution of Staryu before Starmie, or a prevolution of Staryu? Or, maybe, Staryu and starmie were meant to replace an already existing evolutive family, replacing 2 out of 3 members of that family of pokemon (check out the next missingno stats and you'll probabilly discover the 2nd generation Pokemon family was meant to be put in red but then was inserted later). Where did you get that from? At the very least I know that in GSC (Crystal) their grow rate is 5 aka slow. Though it may be different in RBY, I don't know. I checked Red, Yellow, Gold and Crystal and Staryu/Starmie's experience at level 100 was 1,250,000 in all versions. I used GameShark codes to force them into the wild at level 100. However not is the resolution used by MissingN°. pic that corrupt the Hall of fame. The game corrupt the hall because try to decompress bytes that not are images. I've fixed MissingN°. in my italian Pokémon Green, changing in the table (I've repointed the Bikers) the address where load the pic of MissingN°, I've added a damaged pic of the Ghost, but however is a real pic. The first time I've only changed the resolution limit in the table, that was too high in the italian version and was cause of crash, but the hall was destroyed however, and after changing of the address of the pic I've discovered that also a backpic load into battle if not is a real pic, but other bytes, can corrupt the hall of fame. Then I had set a different pic also for the back. And now my MissingN°. is almost safe, however can be dangerous if you evolve it, because some MissingN°. evolve into a corrupt Onix and if it goes to the battle can corrupt the hall. However after the fix MissingN°. continue always to duplicate the item in the 6th place of the bag, because it's his entry number (000) that duplicate because cause an overflow. As we can see there are various unused Pokémon with what appear to be temporary names, ディアー (Deer), クロッキー (Crocky), ジャッグ (Jag), カクタス (Cactus), plus there may be others you can't fully see. Note Diglett and Venonat are numbered 59 and 65, which sure enough are their index numbers in the final game! Deer is number 56, Crocky number 62, Cactus number 67, Jag number 68. These are all index numbers of MissingNo, so these MissingNo. may have been those Pokémon in the past. Jag looks great! Crocky is definitely nightmarish. Deer obviously ended up as Stantler in the later games.